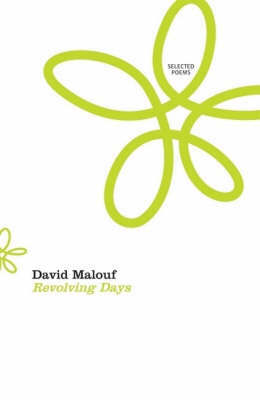 In the very appropriately titled Revolving Days, David Malouf has put together a selection of poems that addresses the past, place and its importance to self-definition, the memory of houses emptied of family and objects yet full of what's left behind and filling up the present. The poems exhibit a quality which, with political comments more subtle than Les Murray's and longings less romanticised than Robert Adamson's, declares that the places where the emotions taken from another world rendezvous are always present and clear in comprehending the discrepancy between place-and-mind and feeling-and-emotion. in childhood for white horses. A unit: but of what? Where now is the whole? Even so, there is no need to worry about every yearning', toothbrush', daffodil bulb' or cloud', Malouf might be saying. In every reader's panorama, there is always what you see and what has meaning. Not everything has meaning at the same time; neither is everything with meaning seen. Indeed, the consistent motif-sequences of angels and their related images (wings, prayer, etc.) attempt to tell us that the relationship between writings and readings is an exchange of the highest order. Even when Malouf's language is straight-forward, almost blunt, you are always required to read into it, as in Early Discoveries' in Part I, Decade's End' in Part II, Out of Sight' in Part III, A Place in Tuscany' in Part IV. And when it is elusive, he still manages to speak in a surprising and clear language, as in Pieces of a Northern Winter' where Fine scribble-lines of ice: the lake tenses / its skin, gives up / its wings'. Polish philosopher Roman Ingarden wrote of the relationship between literary objects and real experience that we always regard represented objects and events from this present moment only, a here-and-now phase. Ingarden followed that idea to suggest, for example, that the events in a poem only take as long to happen for us as we take to read them, even though the poem might tell us that these events spanned several years, their present' in this stanza, their previous events' in the following stanza. In other words, Malouf seems to be saying this to me. I find myself surrounded by things and events where I didn't participate in the existence or identification of those things or in the activities that made up those events when they first made themselves available to me. And yet I am brought into the actions that identify those things and comprise those events. Perhaps this is because conceptualising is not just a concept of the mind; that is, the conceptualising we attribute to the mind. From here on, every mechanism works in and out so that as a reader I am transformed in the most minute degrees as my memories of myself appear to be; the whole world, extending the me with themselves until all possible transformations are complete by will and imagination. In Parts III and IV of Revolving Days the search for suitable methods to express that view seems equal in importance to the details meant to be remembered, whether or not in free verse and or through homage to other poets using their techniques or through translations. The reader's experience even at this level  of method and findings together  continues to take place beyond or behind that world-outside  war, ruin, weakness, physical human failings  so that the interrupted experience also helps to construct the reading; that is, its constructions as experiences within the reading act as our memories behave. Their constructions are defined within the places built by the reader's reading. They allow for conscious reading, for self-evaluation of the interpretation, creating new layers to the appraisal, sometimes remaining themselves; at other times, as on the same planes of the text so that the original experience seems to have acted with a freedom subject to the same rules under which the text has been accepted by the reader. This is, ultimately, the enjoyment of reading poetry and writing poetry. It is to this point that Malouf's angel-ness transports us, perhaps, to where, as he says in Wild lemons': our bodies were / expected at an occasion up ahead / that would not take place without us'. The language that places us, as we are now, in the same country with our memories is a communiqué with ourselves past. This entry was posted in BOOK REVIEWS and tagged Bev Braune, David Malouf. Bookmark the permalink.